Labyrinths have a history that reaches far back into ancient times. They have been built by various cultures around the globe and seem to represent a universal pattern in human consciousness, regardless of the culture in which they were used. 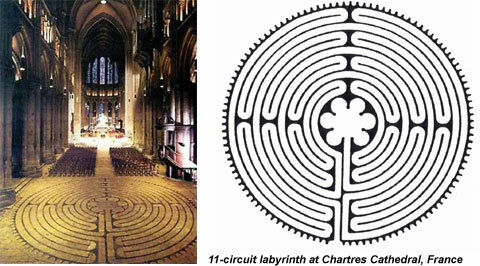 Labyrinths have long been used as meditation and prayer tools. Scandinavia, Crete, America, Sumeria, the British Isles, Italy, India, France, Egypt, and Iceland are a few of the places in which they have been found. They are still used in the sacred ceremonies of the Hopi and Papago tribes in Arizona, as well as by a growing number of people on all continents in this time of a changing millennium. A labyrinth combines the imagery of the circle and the spiral into a meandering but purposeful path. This archetype at its most basic level, is a metaphor for the journey to the center of your deepest self and back out into the world with a broadened understanding of who you are. Labyrinths and mazes have often been confused. When most people hear of a labyrinth they think of a maze. A labyrinth is not a maze. A maze is like a puzzle to be solved. It has twists, turns, and blind alleys. A labyrinth has only one path. The way in is the way out. There are no blind alleys. The path leads you on a circuitous path to the center and out again. When you walk a labyrinth, you meander back and forth, turning 180 degrees each time you enter a different circuit. As you shift your direction you also shift your awareness from right brain to left brain. This is one of the reasons the labyrinth can induce receptive states of consciousness. It can also help to balance the chakras. There was great interest in the labyrinth during the Gothic period, specifically in the sacred lands around Jerusalem during the Crusades. Much more complex in design, in their use of sacred geometry, and in their ritual usage, these labyrinths were often used as an analogy for pilgrimage. These labyrinths served as a substitute for the many who could not make the full journey to the Holy Land. A labyrinth could be viewed as the human brain and its centrally located pineal gland - representing the journey we embark upon to realize our “inner selves”– thus releasing the light and consciousness spark of who we truly are. There are two basic labyrinth designs -- seven circuit and the eleven circuit. The classical 7-circuit labyrinth pattern is the oldest and most prevalent of the labyrinth designs. The earliest known use of the 7-circuit labyrinth symbol occurs on a clay tablet from the Mycenaean palace at Pylos in Greece. A fire destroyed this palace around 1200 BC, baking the clay tablet and preserving it for archaeologists. It has also been found on pottery from over 2000 years old. Notre-Dame de Chartres Cathedral in Chartres, France is a very famous example of an 11- circuit design. It is broken down into four different quadrants, with a flower-shaped goal. The original also has 112 “lunations”, or semi-circular embellishments around the edges. These represent four lunar months of 28 days, and are believed to have had significance in establishing the floating Easter date of the Christian calendar. Following is a series of drawings that illustrate the process one may follow to create a labyrinth pattern of their own.